Is the subject of puppy feeding causing you turmoil? If you're not sure what, or how often, to feed your new Cocker puppy, this article will give you all you need to help your new bundle of fur grow into a strong, healthy adult Cocker Spaniel! When it comes to feeding puppies, it's important to get it right. Just watch me, I'm going to eat it all! Cocker pups grow so quickly during their first few months so they need an especially nutritious diet to help them develop into strong, healthy adult Cocker Spaniels. When you brought your puppy home, your breeder may have given you a small bag of puppy food and instructions to help you with your puppy feeding routine. I recommend you continue using this food because, apart from being specially formulated to help your pup's growth and development during his early months, his delicate tummy and digestive system will already be used it. If you decide to change your puppy's food at a later date, do it gradually by mixing in a little of the new food at each meal time, otherwise you risk upsetting your puppy's tummy. Gradually increase the amount of the new food whilst decreasing the old, over the course of 7-10 days, or longer, until the change has been made. Puppy Feeding Schedule: How Often? Puppies need to be fed small amounts regularly throughout the day so as not to over-stretch their little tummies. Feeding them in this way also keeps their energy levels up all day long. Over 6 months of age: 2 meals each day, morning and evening. Make sure you evenly space your puppy's meals, for example, if you feed him at 7:00 am, his next meals should be at 11:00 am, 3:00 pm and 7:00 pm. You can change these times to suit your own lifestyle, but be sure to leave plenty of time between his final meal and bedtime to allow proper digestion. I don't recommend letting your puppy 'free feed' because their eyes are very often bigger than their bellies and there's a good chance he'll eat more than he needs. Left to his own devices, you'll almost certainly end up with an obese puppy! If kibble is always available, it may reduce your puppy's drive for food which could make make him more difficult to train. And if your dog isn't driven by food, he's unlikely to be motivated by it and is therefore less likely to listen to your training instructions. Feed your puppy as normal and if he doesn't eat all his food within 15 minutes take it away from him. He'll soon learn that if he doesn't eat his kibble at the designated times he'll have to wait until the next meal time. Puppy feeding requirements will be different for every single puppy depending on their size, age and how active they are. Generally, your breeder will offer you the best advice, but your vet can help too. Additionally, you could refer to the puppy food manufacturer's packaging for advice. My experience is that manufacturers' recommendations are often quite generous. I reduced Max's kibble allowance by 10% when he was a puppy because I felt he was becoming a little 'chubby'. Today, I feed him a 'senior' mix, but I still reduce his allowance by around 10% or more if he's had extra bits of chicken or lamb during the day. Feeding Your Puppy: Wet or Dry? You may decide to feed your dog a raw food diet (similar to what a dog would eat in the wild) or you may prefer to feed him what the family eats. Either way it's a good idea to discuss your Cocker's nutritional needs with his vet beforehand. 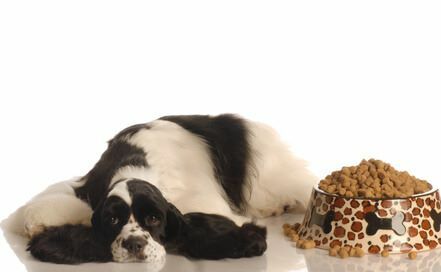 Nowadays, you can buy a wide range of commercial puppy food, ranging from tinned and organic dog food to dry dog food. When you buy commercial dog food you may notice it's sometimes labelled as 'complete' or 'complementary'. 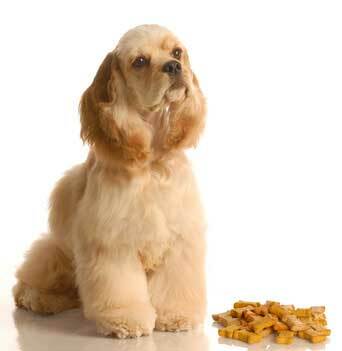 A complete dog food should contain all the nutrition your puppy needs. 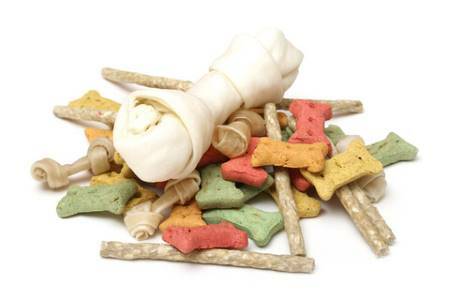 A complementary food should only make up part of your pet's diet because it won't meet his nutritional needs. It is meant to be given with other foods such as mixer biscuits. 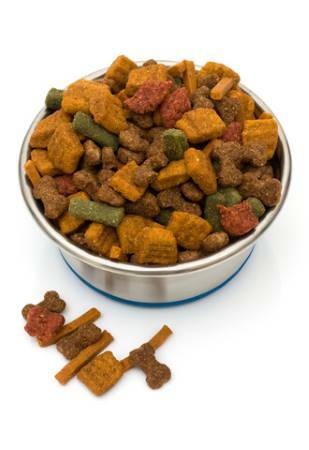 Dry food is a specially formulated complete meal in the form of a small, bite-sized, biscuit known as kibble. Popular flavors are lamb, beef, salmon, rabbit and chicken and it all the essential oils, vitamins and minerals your dog needs. 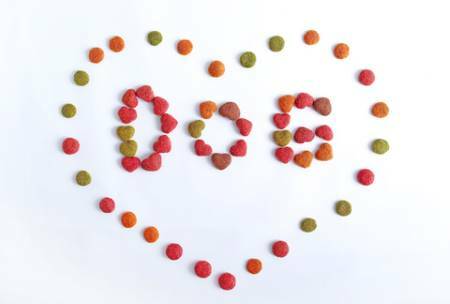 whilst kibble may seem more expensive than other dog food, because it's a complete meal and there's no waste it can work out to be good value for money. Puppy Feeding Tip: Dry dog food contains very little moisture so it's important to make sure your puppy has access to plenty of fresh drinking water. The only down side to kibble (if there really is one) is that recently weaned puppies may sometimes refuse to eat it because it's too dry. To get around this, simply moisten the kibble with a little warm water and let it stand for a few minutes to soften. Step back and watch your puppy wolf it down. Personally, I prefer kibble to wet food. Not only because it provides Max with all the essential nutrients and vitamins he needs to keep him fit and healthy, but because kibble is so easy, needs no preparation, it's clean, and it doesn't smell! And most important of all, Max loves it! If you choose to feed your puppy tinned dog food, ('wet food') be sure to check the label for nutrition levels. Some tinned dog foods are meant to be mixed with biscuits to add texture and extra nutrients to make it a 'complete' meal. Benefits include the fact that it's quick and easy to prepare, especially cans with a ring-pull and many dogs like soft, wet food. However, the down side is that tinned dog food can be messy, can sometimes smell, and needs to be refrigerated when opened and used within a couple of days. Once in the food bowl, if not eaten, wet dog food can dry out. It can also attract flies and other insects, especially in the summer months, which isn't very hygienic! However, the smell of tinned dog food, to dogs at least, can be very enticing! Puppy Feeding: Homemade or Organic Dog Food? If you prefer not to use commercially prepared dog foods, you might like to consider feeding your puppy with home-made organic dog food. Organic dog food is food that's grown and prepared using environmentally friendly practices and is free from herbicides and pesticides. An organic dog food diet can have some great benefits for your pet. Apart from keeping him looking in tip-top condition, it can also add precious years to his life. It's not essential to feed your puppy organic food, but it is essential to use good quality ingredients. If it's not good enough for human consumption, it's not good enough for your Cocker Spaniel! Treats are very often given as a reward for good behavior or during training, but unfortunately, they're not very nutritional. Check the label so that you're aware of exactly which ingredients are in the treats you buy your pup because some can contain excessive amounts of salt, sugar, and fats. They very often contain artificial flavors and colors too. So if you love your puppy feeding him shop-bought treats should be kept to a minimum, if at all. Rewarding Your Puppy With Homemade Healthy Treats! You may want to consider making your own healthy dog treats, in which case you could try a couple of these delicious home-made dog biscuit recipes. If baking's not for you, a really good alternative is to reward him with small pieces of cooked chicken or liver, chopped into little pieces. Dental sticks are another healthy option if you want to reward your dog for good behavior and as a bonus, they will help to clean the plaque off his teeth. Please don't feed your puppy table scraps. Apart from upsetting the well-balanced diet his kibble or wet food provides, feeding him from your table will teach him to beg and the extra calories will soon begin to mount up! And don't forget, any (good) treats or extras given to your dog during the course of a day should be offset against his daily food allowance otherwise your puppy is going to get fat! At this point I'd also like to mention that there are many every-day human foods that can be poisonous to dogs and especially puppies. Chocolate is just one of them and one large bar can kill a small puppy so be careful and make sure all type of chocolate is out of reach of curious, greedy little puppies! If your dog believes that you or any other member of your family are a threat to his food he may become aggressive and food aggression can get very nasty. Just getting too close to your puppy when he's feeding can trigger this. making sure any children in the family understand the importance of leaving the dog alone while he eats. I recommend you take a look at this article so that you know what to look for. It describes the early warning signs of food aggression and steps you can take to either prevent it happening in the first place, or if it's too late, how to remedy it. Always ensure your puppy has access to plenty of clean fresh drinking water, especially if he's fed a diet of dry food. 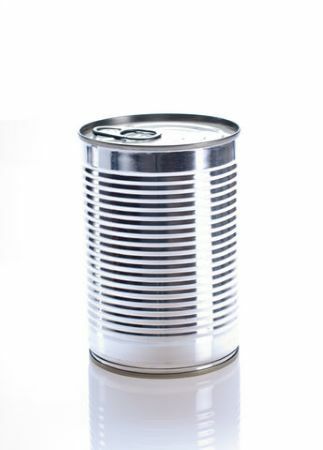 Always keep tinned dog food covered until required, preferably in the fridge. Never feed your puppy with chilled food directly from the refrigerator; always allow the food to come up to room temperature so that it doesn't chill his little tummy. It will taste better too! If you feed your dog wet food and he doesn't finish it, don't be tempted to top it up at the following meal time. This is not hygienic, can attract insects, encourage harmful bacteria, and upset tummies. Don't feed your puppy table scraps. This is a bad habit which will teach your puppy that it's okay to beg, and will almost certainly make your puppy fat. Don't allow your puppy to feed all day long (free feed). If you can't feel your dog's ribs - your puppy is overweight and we all know that overweight dogs are unhealthy dogs! Always take into account any treats given to your puppy and offset them against his daily food allowance. 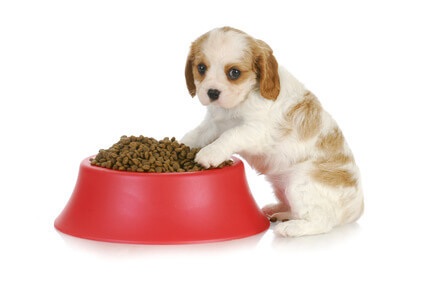 When it comes to puppy feeding, small but frequent meals during the day is best. Always follow your breeder's or food manufacturer's instructions. If you decide to change your puppy's diet, do so gradually, over a period of between 1 to 3 weeks so as not to upset his digestion. It's always sensible to check your puppy's stool regularly as it can be an indicator of health. If your puppy's stool is very loose or he has diarrhoea, his diet may not be suitable for him or he may have a digestive problem. If you're worried about your puppy's feeding or digestion, ie., he won't eat or drink, or his stool is often very loose or contains blood, don't hesitate to call your vet.